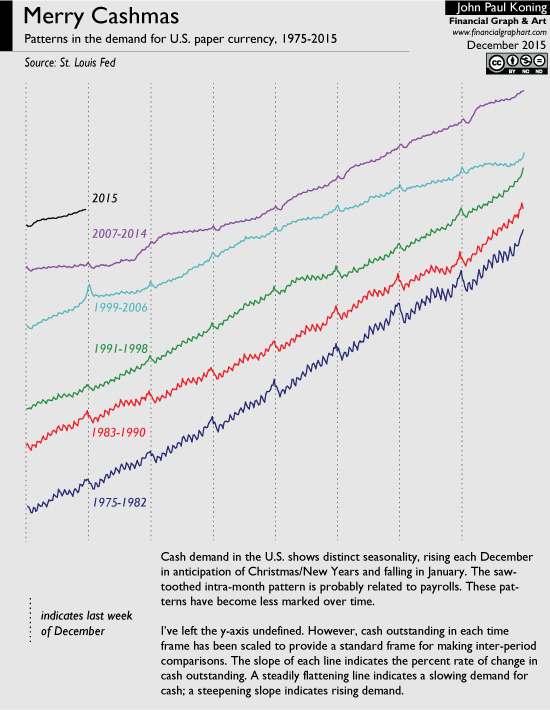 Inspired, I've updated my December 2012 Merry Cashmas chart showing the annual Christmas and New Year's cash demand spike. See below. Tipping might certainly be one reason for the annual cash spike, but I'd bet if you look at data from Europe where tipping is not a tradition you'll still see a jump. Because we can't anticipate all the random events that will arise when we travel long distances to meet our loved ones, we purchase insurance in the form of larger cash holdings. Thus you can see a consistent seasonal spike in currency in circulation in the weeks before Christmas. Those amounts falls heavily in January. Having returned to our regular schedules, insurance against uncertainty is no longer necessary so we redeposit our cash at the bank. The U.S. Christmas spike has gotten less marked over the years, most likely because of increasing usage of U.S. banknotes in non-Christian countries and by criminals. But you can still pick it out on the chart. Whereas the 2007-2014 period (the light blue line) opened with stagnant U.S. cash demand, the 2015-2022 period (the black line) has shown a return to 1990 growth rates. People want U.S. dollars again. Why is this? Well, it has nothing to do with interest rates being near their lower bound. Rather, consider that the U.S. dollar had become quite unpopular as a world transactions medium during the 2000s thanks to its steady decline in value relative to other currencies, especially the euro. Once the euro crisis hit in 2011, that changed. Since then, the U.S. dollar has appreciated relative to almost every currency in the world. Along with this, its cachet outside the U.S. has returned. I go over all these factors in this post. This may be my last post in 2015, so once again, thanks to all my readers, lurkers, haters, and commenters. 1. The final chapter in the Zimbabwe dollar saga? ...of which, I'd say my Lazy Central Banker's guide is the most important. For some reason no one liked Why Big Fat Greek Bank Premiums, despite the fact that I think I pretty much nailed it. And as usual, I wrote my share of material that, at the time, seemed stellar to the author but upon rereading a few months later, t'was dreck. My main blog referrers in 2015 were Mark Thoma, FT Alphaville, Marginal Revolution, Chris Dillow, and David Andolfatto. Thanks! Was Bretton Woods a real gold standard? David Glasner's piece on the gold standard got me thinking about the Bretton Woods system, the monetary system that prevailed after WWII up until the early 1970s. There are many differences between Bretton Woods and the classical gold standard of the 1800s. My claim is that despite these differences, for a short period of time the Bretton Woods system did everything that the classical gold standard did. I'm using David's definition of a gold standard whereby the monetary unit, the dollar, is tied to a set amount of gold. This linkage ensures that there can never be an excess quantity of monetary liabilities in circulation—unwanted notes will simply reflux back to the issuer in return for gold. When most people criticize Bretton Woods, they say that it lacked such a linkage. For a gold standard to be in effect, a central bank's notes and deposits have typically been tied down to gold via some sort of redemption mechanism. In the days of the classical gold standard, central banks didn't discriminate; the right to redeem was universal. Whether black or white, big or small, male or female, you could bring your notes or deposits to a central bank teller and have them be converted into an equivalent quantity of gold coin. Any unwanted notes and deposits quickly found their way back to the issuer. After 1925, the world adopted a narrower redemption mechanism; a gold bullion standard. Economist and trader David Ricardo had recommended this system a century before as a way to reduce the resource costs of running a gold standard. Gold coins were withdrawn from circulation, and rather than offering to redeem notes and deposits in coin, the monetary authorities would only offer bulky gold bars. This excluded most of the population from redemption since only a tiny minority would ever be wealthy enough to own a bar's worth of notes. It might seem that this narrowing of the redemption mechanism compromised the gold standard. After all, if too many dollars were created by a central bank, and these fell into the hands of those too poor to redeem for bullion bars, than the excess might remain outstanding rather than refluxing back to the issuer. But consider what happens if a free secondary market in gold is allowed to operate. Unable to send excess notes to the central bank, less wealthy gold owners can sell them in the free market. This would drive notes to a discount relative to their official price, at which point large dealers will buy them and bring them back to the central bank for redemption in bars, earning arbitrage profits. The free market price is thus kept in line with the central bank's redemption price. So as long as the wealthy and not-so wealthy are joined by a market in which they can exchange together, then a narrower redemption mechanism needn't impinge on the proper functioning of a gold standard. Anyone who has toyed around with ETFs will know what I'm talking about. Despite the fact that a gold ETF limits direct redemption to a tiny population of investors (so called authorized participants), the price of the ETF will stay locked in line with the market price of gold. Authorized participants earn profits by arbitraging differences between the ETF and the underlying, thus maintaining the peg on behalf of all ETF owners. You don't need many of them; just a few well-heeled ones. The U.S. narrowed the gold redemption mechanism even further when, in 1934, Roosevelt limited redemption to foreign governments. As long as foreign governments and the public were joined by a market, then excess notes could be sold to these governments and returned to the U.S. for gold at the official price. The free market price and the U.S.'s official price would converge and a gold standard would still be in effect. Things didn't work that way. After it entered WWII, the U.S. continued to buy and sell gold to governments at $35, but gold traded far above that level in so-called free gold or premium markets in Zurich (see chart below), Paris, Beirut, Macau, Tangiers, Hong Kong, and elsewhere. The existence of premium markets continued through the 1940s and well into the 1950s. While private dealers have incentives to engage in arbitrage, national governments are driven by political motives. Governments no doubt could have earned large profits by buying gold from the U.S. at $35, shipping it home, and selling it in their domestic free gold markets at $45 or $50, but they chose not to, most likely to avoid raising the ire of American officials. The monetary system in the 1940s and 1950s was a malfunctioning ETF. For various reason the authorized participants (ie. foreign governments) were not arbitraging differences between the price of the ETF and the underlying, and the ETF was therefore wandering from its appropriate price. With the redemption mechanism compromised, the supply of U.S. monetary liabilities in circulation could exceed the demand, the result being that the market price of dollars sagged to a discount to their official price. Bretton Woods, with its multiple prices for gold, was not a gold standard, at least not yet. It was only in 1954 that the so-called "free gold" price in Zurich and elsewhere finally converged with the official price of $35. This happened more by accident than purposeful arbitrage conducted via the redemption mechanism. On the supply side, the Soviets were bringing large supplies of "red gold" to sell on free markets while the South Africans were diverting more gold away from official buyers in order to earn wider margins. At the same time, the end of the Korean War was reducing safe haven demand. Once parity between free gold prices and the U.S. official price was established, the London gold market reopened for business. London had always been the largest gold market in the world, far eclipsing Paris, Zurich, and the rest. Its re-opening had probably been delayed for face-saving reasons. Given that the Brits and the Americans effectively ran the world's monetary system, they could safely ignore premium markets in Zurich and Paris. But the existence of a British gold price in excess of the official price would have been embarrassing. Upon the market's reopening, British authorities limited the ability of locals to buy on the market (they could freely sell) but put no restrictions on the ability of foreigners to participate in the London gold market. From the time it opened in 1954 to 1960 the London price was well-behaved, staying locked in line with the official price. In October 1960, however, speculators took over control of the London gold market and sent the price of gold to an intraday high of $40, well above its official price of $35. Rather than arbitraging the market by buying from the U.S. Treasury at $35 and selling in London at $40, foreign central banks stepped aside. The authorities' response to the 1960 gold crisis is what finally turned Bretton Woods into a real gold standard, at least in my opinion. While the U.S. had ignored premium markets in the 1940s and early 50s, they couldn't ignore a premium market in their own backyard. At the behest of the U.S., the London gold pool was formed. Under the management of the Bank of England, the pool assembled a gold war chest with contributions from the U.S., U.K., Germany, Holland, France, Italy, Belgium, and Switzerland. Whenever gold rose above $35.20, the pool sold gold on the London market in order to keep the price steady. When it fell to $34.80, it bought in order to support the price. The existence of the pool was never officially declared, but everyone knew it was in operation and had the task of setting the London gold price. This effectively created a functioning gold standard. Before, the only mechanism connecting the public's excess dollars with the U.S.'s gold was the somewhat unpredictable predilection of foreign governments to buy that excess and exercise the right to return it for redemption. Now the public could deal directly with the U.S. government by selling on the London gold exchange to the U.S.-led London gold pool, which guaranteed a price of at least $35.20. And as the chart below shows, the pool worked pretty well for the next few years, keeping the price of gold in a narrow range. However, the devaluation of the British pound in 1967 and the departure of the French from the gold pool shook confidence in the $35 peg. The system imploded in March 1968 when a steady jog into gold accelerated into an all out run. Rather than continue to bleed gold to speculators, the London gold pool disbanded and the price of gold in London shot up to over $40, well above the official price of $35.20. But from 1961 to 1968, the world pretty much had a gold standard. Or, put differently, thanks to the opening of the London gold market and the arming of the London gold pool, the world's monetary system between 1961 and 1968 did pretty much everything that the gold standard of the 1800s did. After 1968, the U.S. dollar slid back into its earlier Bretton Woods pattern of having more than one price in terms of gold; the $35 official price and the "free" London price. This was no gold standard. When Nixon famously dismantled the already-narrow redemption mechanism in 1971, most of the damage had already been done. Jessie Smith, who owns a dusty motel in Beowawe, Nevada, had to turn away customers yesterday. No vacancy, Smith told the recent arrivals, the first time she has uttered those words since she bought the motel twenty years ago. These days, the desert is swimming in cash... literally. Over the last six months, a booming business in illegal cash storage has sprung up in Nevada, New Mexico, and Arizona where analysts estimate that $30 billion worth of $100 notes have been hidden. By day, smugglers drive deep into the desert, SUVs loaded down with suitcases full of Ben Franklins. Once they've found an ideal spot, they wait till the sun goes down and frantically dig a hole, only to drive away the next morning with nothing but the cache's GPS coordinates and a drone or two to guard it. When asked about the sorts of people staying at her motel these days, Smith shrugs. "I don't ask who they are and they pay cash." This is life in the Great Deflation. What began as a steady disinflation early last decade (a decline in the global rate of inflation) slowly turned into all out deflation by the turn of the decade. In response, central bankers around the world simultaneously increased their inflation targets from 2% to 4% and fully re-loaded their quantitative easing programs. To their embarrassment, consumer prices only continued to decline, crescendoing into what the press has dubbed hyperdeflation; annual global price declines of 2-3%. The Fed is currently in its fifth round of QE and, along with most central banks, has kept its key interest rate at the effective lower bound of -1.25% since 2019. To no avail. Consensus among central bankers is that -1.25%, and not 0%, is the lowest interest rate that the public will endure before converting deposits into 0%-yielding cash. This level emerged as the consensus when the Swiss National Bank reduced rates to -1.5% back in 2018. A stampede into Swiss banknotes ensued. When the Bank dialed the rate back to -1.25%, the Swiss public re-deposited notes back into their bank accounts. Since then, no central banker has dared reduce rates below this magic level. If they did, they'd risk losing control of monetary policy (as if they haven't already) as well as causing a run on the banking system. Throughout 2019 and 2020 the world's monetary architects have been steadily dismantling effective lower bounds in many large economies, giving central bankers, until now stuck at -1.25%, the ability to reduce interest rates deep into negative territory. Many say that the world is on the cusp of something so new that we don't even have a word for it. The opposite of disinflation (disdeflation? ), the dawning phenomenon of gradually declining deflation is being dubbed by the econblogosphere the Great Reflation. Some are forecasting that we'll soon be moving back up to -2 or -1% deflation... maybe even zero. The Europeans started to dismantle their lower bound in 2019. They did so by having the ECB cancel all 500, 100, and 50 notes, leaving only the lowly 20 to circulate as the eurozone's highest denomination bill. And when a new 20 euro note was issued in January of last year, the ECB doubled its surface area from 72x133 mm to a cumbersome 108x200 mm. A standard suitcase now only fits half as much raw value, thus burdening noteholders with extra storage and handling costs. Even when folded in half, a single 20 note no longer fits snugly into a pocket. Which means that when the ECB drops rates into deeply negative territory (which it is expected to do at its next meeting), the European public probably won't bother converting deposits into clunky cash. The U.S. was soon to follow. Unlike Euro notes, American bills are 70% cotton. So when the Fed first floated the possibility of removing $100 and $50 denominations from circulation last year, the cotton lobby exerted enough pressure that Fed officials decided to rethink their strategy. Instead of withdrawing $100s and $50s, the Fed asked Congress to make mass cash storage illegal. As of July 2020, any member of the public caught holding more than $1000 in bills risks having their stash confiscated, with corporations and financial institutions facing cash limits of their own. In theory, this should allow the Fed to set deeply negative interest rates. Which explains why Nevada's deserts are being punched full of holes. The $1000 limit, combined with the possibility of deeply negative rates next year, means that storage of 0%-yielding paper has the potential to be incredibly profitable. To combat the so-called desert dollar industry, the U.S. Secret Service's counterfeit currency team has been retasked with patrolling vast empty patches of desert. So far their raids have had mixed success; smugglers have been diverting their hoardes across the border into Mexico or Canada. New legislation is being tabled to restrict cash exports and should be passed later this month. In any case, the significant costs that smugglers face in evading the Secret Service means that the Fed should be able to safely bring rates to -3% or so at its next meeting without facing mass flight into paper dollars. Despite having dismantled its lower bound, the Fed held back from a rate cut at its recent policy meeting. Why? There is a growing faction in the Fed that says that reducing interest rates could very well prove disastrous. Not only would a cut not stoke inflation, it could exacerbate the existing hyperdeflation. To replace hyperdeflation with inflation, you need to raise interest rates, not drop them, claim members of this faction. Ratchet the interest rate up to 3% and arbitrage dictates that a gentle inflation will be restored. After all, if the Fed is compensating investors with a 3% return on its highly-liquid risk-free liabilities, then those investors will be content with an expected decline in the purchasing power of those liabilities, say a 1-2% inflation. Once a taboo idea, the ongoing inability on the part of central banks to reign in deflation has brought this sort of turn-the-wheel-left-to-go-right thinking into vogue. Not only are central bankers finding it increasingly difficult to understand their traditional interest rate tool—it may not do what they always thought it did—but bond traders have been thrown into confusion. For years, the ECON 101 courses they learnt in college taught them that a reduction in interest rates leads to higher prices, not lower ones. Now they're not sure. Jessie Smith, however, is 100% sure where she casts her lot; whichever direction keeps the cash flowing into Nevada. She's hoping that the Fed plunges rates to -5% next year, which would only increase her customers' incentives to store cash. As for a hike back into positive territory, the thought makes her shudder. Why hold 0% cash when you can earn 2 or 3% in the bank? Nevada's desert, now full of cash, would rapidly return to normal, and Smith's hotel would go back to having vacancies again. How much is a corporate vote worth? To answer this question, look no further than behemoth Google. One of Google's voting share costs $779, around 1.7% more than a non-voting share at $764. Why has a "voting premium" emerged in Google shares? How might the shape of this premium evolve? A bit of background first. The public can invest in one of two Google share classes: Class A shares, listed as GOOGL, or Class C shares, listed as GOOG. Class A shareholders benefit from one vote per share whereas Class C shareholders get no vote. Because a vote is the only difference between the two classes, we can infer that the Class A premium represents the value that investors attach to voting power. The total market cap ascribed to the 288 million or so Class A votes is $4.3 billion. (Note that Google has been recently renamed Alphabet). 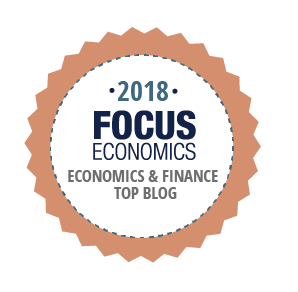 Since non-voting shares were first issued in 2014, voting shares have been worth as much as 5% more than non-voting shares with a minimum premium of 0.5%. It just so happens that Canada, my home and native land, provides plenty of fodder for understanding Google's odd capital structure. For decades wealthy Canadian families have been using dual share class structures to simultaneously get access to capital markets while retaining control of the family firm. Sell the public non-voting shares (or single voting shares) and retain the voting class (or multiple voting). Think of the Bombardier family, the Desmarais clan (Power Corp), or the Billes bunch (Canadian Tire). With Google's dual share structure still relatively new, should Google's investors expect a differential that reaches the size of Rogers' differential, which has hit as high as 15%? Let's work through the logic. In Canada, the existence of a gap is usually traced to the unequal way that the two classes are sometimes treated in takeovers. A buyer desperate to consummate a deal with a Canadian-listed company characterized by a dual share structure will often offer voting shareholders a large premium to buy their vote while dangling a much smaller reward in front of non-voting shareholders. For instance, in 2006 Bell Globe Media paid the owners of CHUM’s voting shares 12% more than it paid owners of non-voting shares when it took the company over. When BCE acquired Astral Media in 2012, it offered non-voting shareholders $50 per share (a 39% premium to the market price), single voting shareholders $54.83 (a 9.7% premium on top of the 39% premium accorded to non-voting shares) and multiple voting shareholders $769, an astonishing 1438% premium! This sort of favoritism is detrimental to small shareholders. If an acquirer has earmarked a fixed amount of dollars to make a deal, non-voting investors may very well have to give up a large chunk of that pie to the voting elite. That may explain why Google's voting shares trade at such a large premium to the non-voting shares. When you buy non-voting Google shares, you do so at your peril. Buy the voting shares and at least you have a degree of protection against a low-ball takeover offer. Note that this sort of unequal treatment may apply in share collapses too. When Toronto-listed ShawCor eliminated its dual class share structure in 2013 in order to adopt a standard single share structure, Class B multiple voting shareholders received 10% more of the newly-created shares than Class A subordinate voting shareholders did. By analogy, should Google ever choose to revert to a regular structure, Google Class C non-voting shareholders may not get as much of the new entity as its voting shareholders get—which might help explain the current 1.7% premium. Non-voting shareholders are not without protection here in Canada. The degree of protection afforded depends on the coattail provisions that may (or may not have) been accorded to non-voting shareholders in a company's charter. Coattail provisions dictate that should a takeover occur, all classes of shareholders are to receive equal terms. In essence, the weaker group gets to "ride on the coattails" of the stronger. Since 1987, the Toronto Stock Exchange requires that all new share listings that suffer from voting restrictions include coattail provisions in their corporate charter. However, shares with restricted voting rights issued prior to 1987 were grandfathered their existing structure and not obligated to provide coattail provisions. The protection offered by coattail provisions tends to reduce dual share pricing disparities. For instance, the difference between the subordinated and superior voting shares of Dorel, issued in 1991 and therefore not enjoying grandfathered status, have averaged around 1.05% since listing, much narrower than the 5% gap between Rogers share classes (which was grandfathered its unequal structure). As these Canadian examples illustrate, the size of Google’s Class A premium over Class C non-voting shares should be very sensitive to the protections afforded to Google Class C shareholders in the event of a corporate change of control. So what about Google's coattails? Does it have any? In a nutshell, in the event of a merger, consolidation or other business combination requiring the approval of shareholders, holders of the Class A and C common stock have the right to receive the “same form of consideration” as the holders of the privately-held Class B common stock, the latter being the shares owned by founders Sergey Brin and Larry Page. So if Brin and Page are offered $800 for their shares, and they accept, then all other shareholders get the same right. So given a cursory read through of Google's articles, a takeover premium on Class A shares should not exist and Google's share gap should not be wide like Rogers' share differential. Google coattail provisions as set out in the 'equal status' clause prevent it. Go out right now and short the living daylights of voting shares while going long the non-voting. It's an easy arbitrage. Or not. The Canadian business community has a long history of successfully evading the triggering of coattail provisions. In 1997, for instance, Emily Griffiths offloaded the Griffith family's business, Western International Communications, or WIC, by selling its voting and non-voting shares to Shaw Communications, the voting shares being pawned off at a $22 premium to non-voting shares. WIC's articles contained coattail provisions that, in principle at least, should have allowed the non-voting shareholders to enjoy the same takeout price as the voting shareholders. Griffiths were able to structure the deal to avoid setting off the coattail provision (specifically, she sold her stake to multiple parties along with Shaw) and thus extracted the entire takeover premium for herself. What does this have to say about the value of a Google vote? Beware the fine-print. As in WIC's case, an able team of lawyers might be able to hack Google's Class C coattail provision in order to steal money from the pockets of non-voting shareholders to put in the pockets of voting shareholders. If so, that would explain why a voting premium exists; it represents the price that investors are willing to pay to insure themselves against such chicanery.